I love birthdays- other people’s birthdays, that is, since I made the choice to stop celebrating my own in an attempt to stay 22 forever. Best. Idea. Ever. Just last week, one of my best friends celebrated her 22nd birthday with an 8-hour flight home from Italy. She spent 7 weeks studying architecture abroad as part of her university’s Siena Studio program . So needless to say, I wanted to celebrate her birthday and homecoming with something BIG- 6 layers big. One of the most endearing tales of all time is that of Dorothy from L. Frank Baum’s, The Wonderful Wizard of Oz. I can’t think of a little girl who didn’t crave tiny red sparkly shoes or hummed to the tune of “We’re Off to See the Wizard.” Nor can I think of anyone, ever, not having nightmares of the flying monkeys once this book turned movie in 1939. I still get the heebie jeebies thinking about them. 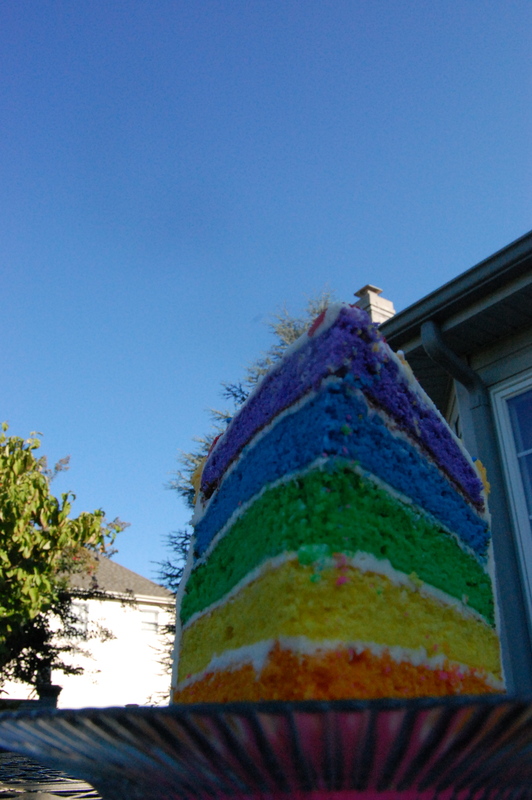 With the help of my friend Marissa, whose photo is seen above, we recreated The Wonderful Wizard of Oz as a skyscaper-esque 6-layer rainbow cake! I was inspired by a post from With Sprinkles on Top, a great blog for picking up some decorating ideas. 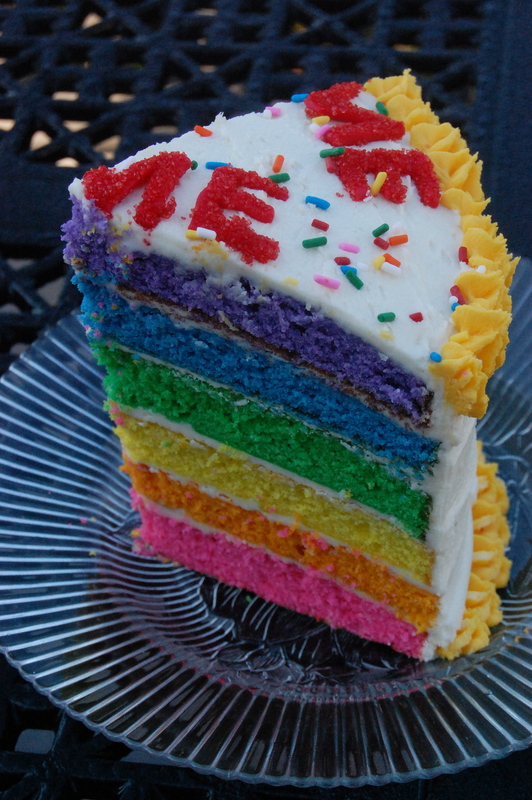 With Sprinkles on Top made a similar cake, appropriately called Rainbow Cake. Since the moment I saw it, I had been itching for the excuse to make it. 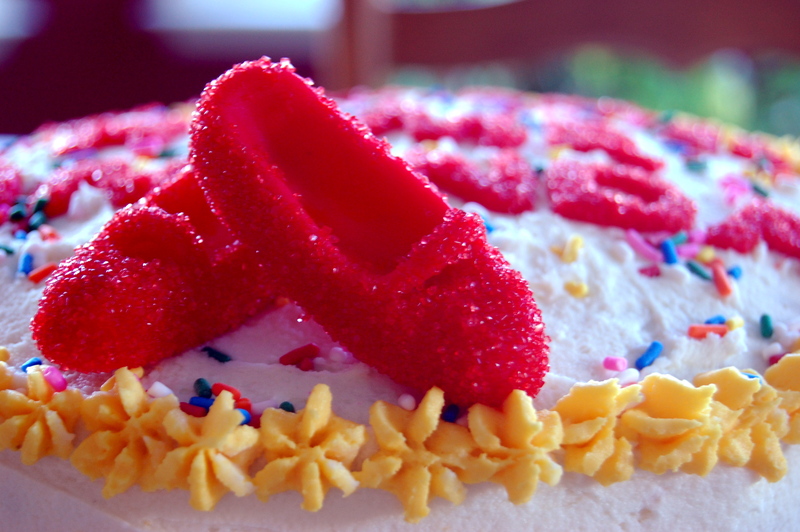 With ruby red slippers molded from fondant, yellow piped homage to the yellow brick road, and some rainbow sprinkles, Amanda’s Somewhere Over the Rainbow birthday cake came together. Gel food dye in the colors of your choice. I used Wilton gel colors in Lemon Yellow, Rose, Violet, Royal Blue and Kelly Green. For the orange layer, I used a mixture of the Golden Yellow with a little Copper added into it, though there is an Orange available. These can easily be found at Michael’s Arts & Crafts, A.C. Moore, or any specialty baking store. 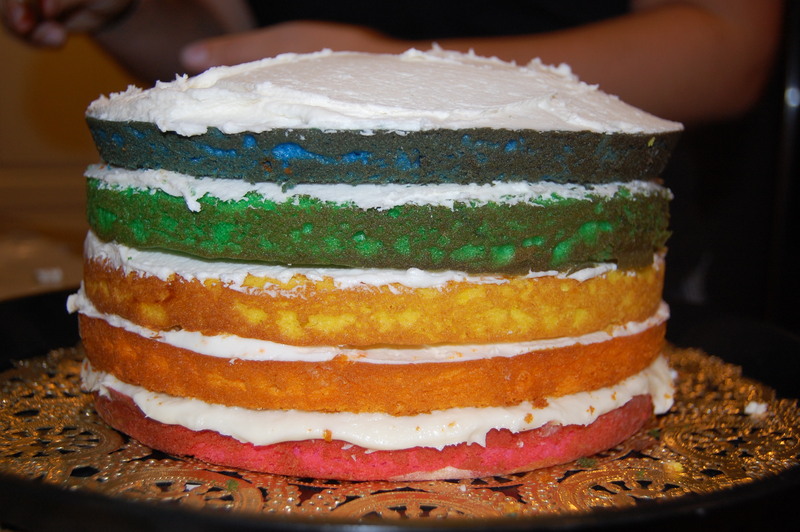 You can also use 2 boxes of your favorite store bought cake mix and add the dye to that. It is cleanest, and easiest, to make this recipe in 3 batches instead of trying to make the batter for all 6 layers at the same time. This ensures that each layer will come out the same thickness. In a large bowl, mix 1 stick of butter and 1 cup of sugar until smooth. Add in 2 eggs and beat until fluffy. Mix in 1 teaspoon of vanilla extract. In a medium sized bowl sift together 1 1/2 cups flour, 1 teaspoon baking powder, and 1/2 teaspoon salt. Alternate adding the dry ingredients and 1/2 cup buttermilk into the wet ingredients. Add an extra splash of buttermilk and mix. Separate the mixture evenly into 2 bowls. Begin with whichever two gel dye colors you’d like, mixing one color into one bowl and another color into the other bowl. Grease two 9 inch cake pans and fill them each with a color batter. It will be a thin layer of batter, but once it rises, it will be the perfect layer of cake, without having to trim off the top. Cook for 15-20 minutes or until cooked through. You can check this by poking the center with a toothpick. If it comes out clean, then it is good to go! Repeat these steps until you have all 6 colored cakes. You can also use 4 cans of your favorite, ready to use, vanilla frosting. Add in heavy cream, starting with 3 tablespoons and adding more if needed, and vanilla extract. Reserve enough icing for the piping, and dye it golden yellow. Frost your cake with icing and pipe the outside golden yellow using a large star tip. 1 container of Duff Goldman by Gartner Studios Fondant in Red. This can be found at Michael’s or A.C. Moore. They are sold in 2 pound containers. For the slippers, mold the red fondant into the shape of Dorothy’s ruby red slippers. If it starts to get to warm to work with, put it in the fridge for 5 minutes and then continue. Once they are molded, put it in the fridge for 10 minutes for firm up. Take the slippers and brush them with some water. Then, coat them with the red sugar sprinkles until they are glittery and gorgeous. For the lettering, the same technique applies. Print out, on computer paper, the phrase you want to put on the cake in 100 point font and in any style you’d like. Cut the letters out. Roll out the fondant to desired thickness. Mine was about a quarter inch thick. Then, lay down the letters onto the fondant and cut the letters out using a small knife. Glitter them just as you glittered the shoes and assemble the cake however you’d like. 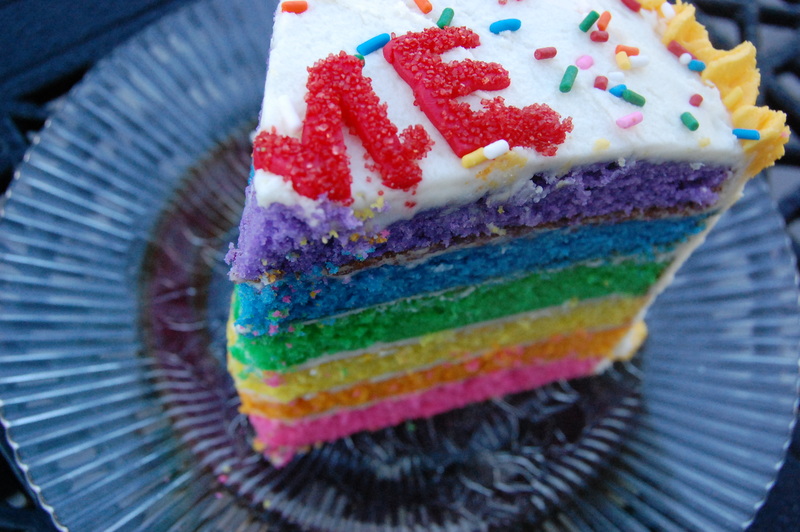 Sprinkle the finished cake with some rainbow sprinkles.